We got all enthusiastic about our vege garden this year, after moving into our new house. It has been such a beautiful sunny summer this year. Almost no rain for months. The rest of the garden has really suffered but we were a bit more careful with this little patch . The best thing has been the telegraph cucumbers, which started out as one tiny little seedling and has now crawled all the way off the garden bed and down the path, producing at least twenty huge cucumbers. 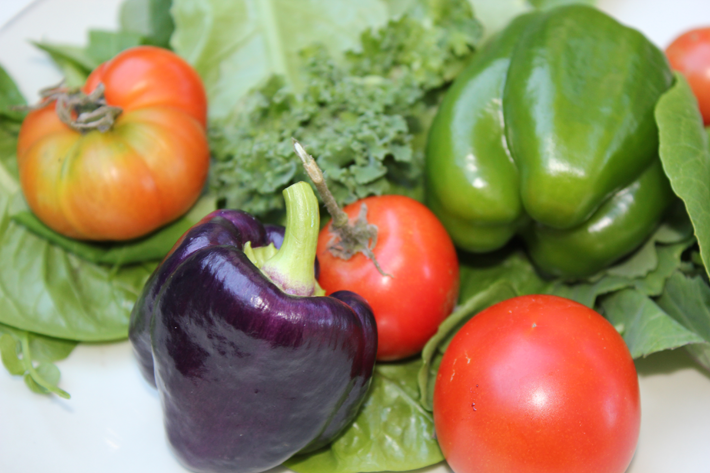 What do you think of the purple capsicum? Looks better than it tasted unfortunately. It was an interesting texture, but quite dry and not very fleshy on the inside. It has inspired me to see what interesting varieties I can grow from seed next year though.